Karma is a woman of indomitable will and unbound spiritual power. She is the soul of Ionia made manifest and an inspiring presence on the battlefield, shielding her allies and turning back her foes. A strong leader torn between tradition and revolution, Karma seeks to protect the peace of Ionia - by force if necessary. The first champion to feature an 'Art Spotlight' before release. The first to be fully relaunched. Like Jayce Karma used to have six ranks on each basic ability and only one on her ultimate. 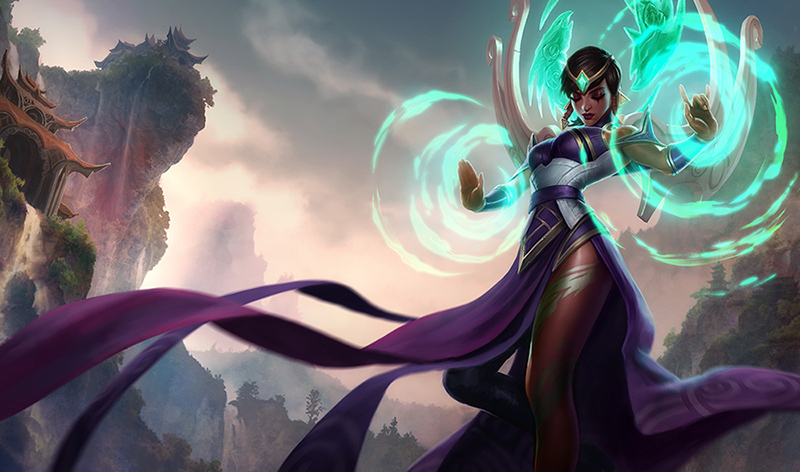 Channel the powers of Ionia in this Champion Spotlight as Karma, the Enlightened One, now completely remade and ready to rejoin the Fields of Justice. In her new role as mage-support, Karma goes toe-to-toe against opponents in solo lanes or when paired in a traditional bot lane. With a versatile skillset that protects allies and blasts opponents, as well as three distinct ways to supercharge her abilities with her ultimate, Karma's dangerous no matter which role she fills on your team. Gathering Fire rewards aggressive play. Look to land abilities and basic attacks on your opponent to lower Mantra's cooldown and stay on the offensive. When using Focused Resolve, slow your opponents with Inner Flame or speed yourself up with Inspire if you're having trouble sticking to a target. Don't be too conservative with Mantra. Gathering Fire is strongest in teamfights, making it easy to recharge Mantra multiple times. Karma's passive lowers her Mantra cooldown when she hits enemy champions with abilities and basic attacks. Deny her from getting free hits on you. Karma's Soulflare erupts for bonus damage in the area in which it's placed. React quickly and escape the circle to avoid taking heavy damage. Focused Resolve is a strong disengage tool. Create distance to avoid being rooted and seek to engage afterwards. If you are playing Karma mid and upgrade encountered difficulties, you can choose our lol level boost, ELO Boosting services, this is to upgrade the best, fastest and most secure way. What Makes League of Legends The Greatest Game in the World?